Mississauga Hyundai | Blog | What’s New With the 2019 Hyundai Santa Fe? What’s New With the 2019 Hyundai Santa Fe? The Santa Fe is Hyundai’s best-selling SUV, with sales of more than 1.5 million units in the US and Canada, the Santa Fe is among the most popular SUV available. And for 2019, the fourth generation Santa Fe will be completed revamped, building on the successes of previous models while offering an all-new family-oriented interior, loaded with practical cutting-edge technologies and a bold new exterior. What was previously known as the five-passenger Santa Fe Sport will now simply be called Santa Fe. The current long wheelbase three-row, seven-passenger model called Santa Fe will be renamed Santa Fe XL for the 2019 model year, which makes differentiating between the two models easier for consumers and dealers alike. The front fascia of the 2019 Santa Fe is highlighted by Hyundai’s signature cascading grille along with a composite light design that includes LED Daytime Running Lights positioned on top of the LED headlights. The exterior design is characterized by a powerful wide stance and a bold look that is enhanced by refined lines that reinforce the capabilities of the Hyundai’s Santa Fe lineup. The 2019 Hyundai Santa Fe interior design combines premium quality with a spacious layout and enhanced visibility. Other improvements the driver will see that the outside mirrors are mounted lower and further rearward and the A-pillars have been reduced in size. The cup holders in the center console have been repositioned for ease of use while the height and length of the center armrest has also been increased. Interior cabin space has been enlarged in the 2019 Santa Fe. There’s now more cargo room when second-row seats are folded. In addition to more cargo space, second-row legroom has also been lengthened to be best-in-class. Engineers also have incorporated one-touch folding second-row seats. Ride comfort, handling, and stability are improved through the ongoing development of the suspension system of the 2019 Santa Fe. While they might at first seem like minor changes, they can have a major impact, like the relocation of the rear shocks reconfigured from upright from an angled position, improving the ride and handling no matter the driving conditions. An optional self-load-levelling rear suspension provides the Hyundai Santa Fe with a level ride height even while towing or carrying heavier cargo. This system allowed Hyundai engineers to tune the rear suspension for ride comfort without making it too firm for occasional trailer use. The 2019 Santa Fe line-up offers a choice of three proven powertrains – two petrol and one diesel. Standard is a 2.4L inline four-cylinder GDI petrol engine with 185 horsepower. Available is a more powerful, turbocharged 2.0L four-cylinder petrol engine that develops 235 horsepower. Then there’s the 2.2-liter CRDi turbodiesel engine with 190 horsepower and 322 lb. ft. of torque at a wide torque range of 1,750 to 2,500 rpm. All engines are mated to a brand-new crisp-shirting eight-speed automatic transmission. 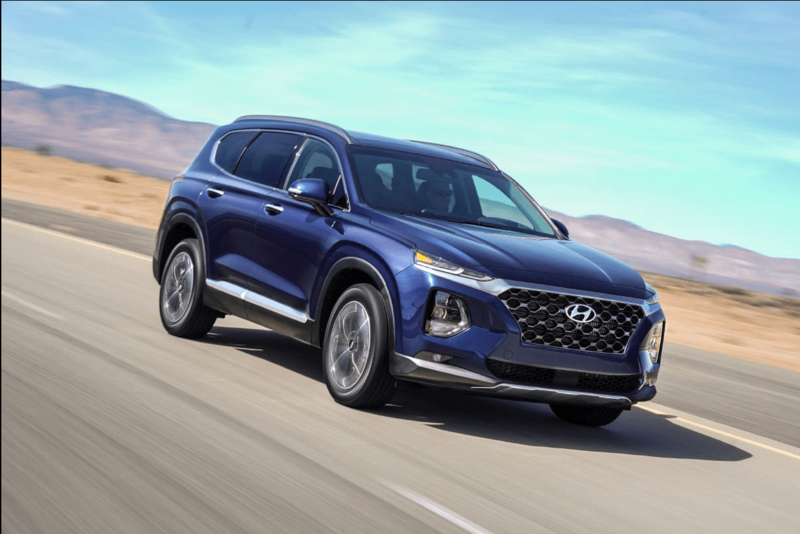 The 2019 Santa Fe is available with Hyundai’s HTRAC All-Wheel-Drive (AWD) system. The HTRAC AWD system was developed as a multi-mode system, providing an electronic, variable-torque-split clutch with active torque control between the front and rear axles. The driver-selectable HTRAC Normal, Sport and Smart modes help provide confident control in all weather conditions. The 2019 Hyundai Santa Fe features AVN 5.0 navigation system with Android Auto and Apple CarPlay offered with higher level trims. The base level trim gets a standard 7-inch user interface, also equipped with Android Auto and Apple CarPlay. And to eliminate the need for a charging cord, there’s an available Qi wireless charging pad for compatible Android devices, as well as Apple iPhone 8 and iPhone X. At the top of the heap is the available 640-watt, 12-speaker new Infinity branded stereo system with an 11-channel amplifier features Clari-Fi and QuantumLogic Surround Sound technology. Hyundai’s Rear Cross Traffic Collision-Avoidance Assist (RCCW) utilizes the Blind Spot Detection system radar sensors when backing up so that the system can not only warn the driver if a vehicle suddenly approaches from the rear side, but it also applies the brakes automatically as well. The 2019 Santa Fe also receives Hyundai’s first Safe Exit Assist. This feature temporarily prevents doors from being opened when a vehicle approaches from behind even when the doors are unlocked. Additional safety features include Rear Occupant Alert which monitors the rear seats to help detect the movements of children and pets. If the system detects movement in the rear seats after the driver leaves the vehicle and locks the doors it will honk the horn and send a Blue Link alert to the driver’s smartphone via Hyundai’s Blue Link connected car system. There’s so much more to the 2019 Hyundai Santa Fe and Santa Fe XL that we have space to cover, features like BLUE LINK Connected Car System with enhanced safety, diagnostic, remote and voice guidance services. The best way to learn about all the great standard and available features is to drive into Mississauga Hyundai and let the Hyundai SUVs experts explain the new functionality and send you out on a test drive.